When I first started our financial firm back in October of ’09, one of the biggest concerns that we originally had was how we were going to compete against other guys that had raised tens of millions of dollars. All we started off with was my money. We even lost several agents. They came to me and said, “Pat, you’re going to go out of business. Everyone is going to be affected by this. You’re making a big mistake. You shouldn’t be doing this. It’s going to hurt a lot of people.” But I stuck with it because I recognized that there are many forms of capital for entrepreneurs, and that financial capital isn’t the most important type. 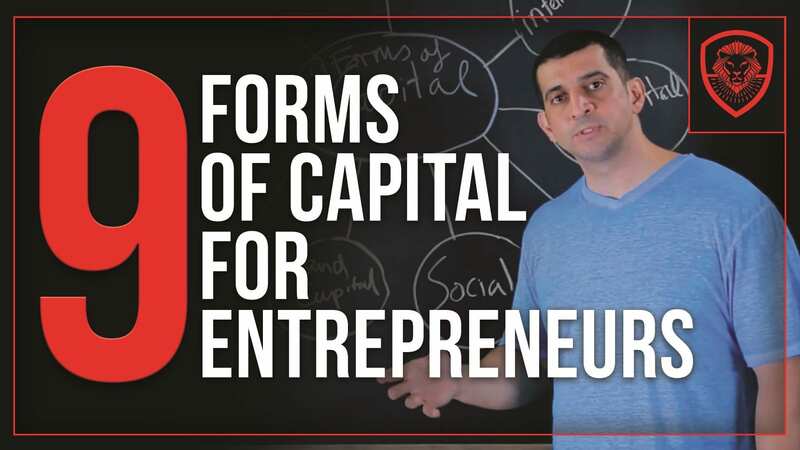 In this video I get into nine different forms of capital for entrepreneurs, and which type of capital is the most important. This is the form of capital we hear about all the time, right? Many people say to me, "Hey Pat, I feel like the reason why I can't be a business owner is because I don't know how to raise millions of dollars. I need a lot of financial capital. How do I raise it?" Sometimes people start off with a lot of money. They may have a lot of money and a decent idea, but since they have the money, there isn't a high level of urgency. But financial capital is only one form of capital. We'll get back to that in a bit. You don't hear about spiritual capital a lot, and you may be asking, "What is spiritual capital?" Spiritual capital is when a faith-based community targets a product. There are a lot of products that are tied to a certain faith, to a certain religion, and that entrepreneur has an advantage because they know exactly how that faith thinks or how that community and that religion thinks. That's what you call spiritual capital. Here's an example of land capital. Let's say that you have 10 acres of land in Napa Valley. Your grandparents owned it, they left it to you, and you want to start a wine company using that land. You just happen to have land in a prime location for what? Wine! Why? Because the key to making the best type of wine is the biggest difference in temperature, meaning that the temperature goes from very high to very low. That's exactly why Napa Valley is a prime location for land. And that's exactly what land capital is. In this case your edge when you're negotiating with somebody else is that you happen to have 10 acres of land in Napa Valley. Social capital is a cause, a crusade, with a group of people that have bought into the cause. They want to do something about it to make a difference around the world. Unlike many other forms of capital, you cannot buy social capital. Social capital comes from the heart, from feelings, from the desire to correct an injustice. A lot of companies want to invest in social capital because their biggest problem is social capital, since it's something they can't buy. Listen in here for my thoughts regarding cultural capital. The next type of capital is experiential capital. What is that? Let's say you're starting a technology company and you have experience in technology. You don't have any money to start the business, but you've worked at Google. You've worked at Facebook. You worked with Zuckerberg, and were there when Facebook first started. That's an example of experiential capital. Intellectual capital is patents and trademarks you may own, and knowledge and wisdom you may have in a particular area. Renewable energy is an example of natural capital. Material capital are things like tools and machinery. As I said at the beginning, most people think the most important form of capital is financial. But you've got to ask yourself which form of capital you have. If you need financial capital, you better have one of the other forms of capital listed above. And just so you know, financial capital is the easiest form of capital to get, as long as you have one of the other forms of capital. If you want to raise capital, be prepared to answer questions regarding the forms of capital you have. For instance, they may have questions regarding intellectual capital such as which patents you hold, or what experience you have. So be prepared to answer questions regarding all your forms of capital so you can make an argument for their investment. You: I need to raise some money. The investor: How much money do you want? You: A half a million dollars. The investor: Why would we give you a half a million dollars? You: That's a perfect question. Let me explain to you why you should give me a half a million dollars. First, I have 7,800 people that are part of my network who all are soccer moms. Their kids need uniforms, but they don't like their current uniforms because the material makes their kids' skin itch and gives them a rash. I've found a material that is anti-itch and is comfortable for any skin type. It's more gentle than fabric from any of the competitors. I'm the chairman of the board for these 7,800 soccer moms, and they've already told me they're interested. I also have five women that want to help me out with this. They are in all different chapters. The investor: What type of experience do you have? You: I have a partner whose expertise is fabric. She's been in the fabric business for 28 years, and she knows the best type of fabric to use. Nike uses it, Under Armour uses it and these other well-known companies use it as well. But they've quadrupled the cost because they have big names. We don't have a name, but we can focus specifically on kids. Now, let's work backwards. Some of you guys messaged me and you say, "Pat, I have 20 million dollars to invest." If you're on the financial capital side, your struggle isn't money. Either you have the money because of the sale of a company, you were part of a company, the company went public, you had shares, you received an inheritance, or you've landed a sports contract. What type of material capital do you have? Do you have any type of natural capital? What type of experiential capital do you have? What type of cultural, or spiritual connections do you have? Do you have any land capital? Do you have any type of intellectual capital? Do you have the patent on that? After evaluating the answer to these questions, you make a decision. Figure out all of the forms of capital you have that you can leverage. And keep in mind that financial capital is very, very, very, very, very easy to get. In my opinion, social capital is by far the most important one. Social capital to me is priceless. A company with social capital is so valuable. Words can't even describe the importance of social capital. Whether you're the person with money, or whether you're the person that needs money, you now have a formula to use. Obviously, this was a short video, with a simple message. So now that I've given you a framework, go do your own due diligence on this to find out different forms of capital and how to use them effectively. So with that being said, if you have any questions or comments, you can post them on the bottom, and if you haven't already subscribed to this channel, click on the button below to subscribe.